This is a post from my draft folder that I completely forgot about! Like from last summer! It has been SO unseasonably warm the last week or two and it got me looking through things I'd written from sunnier days. 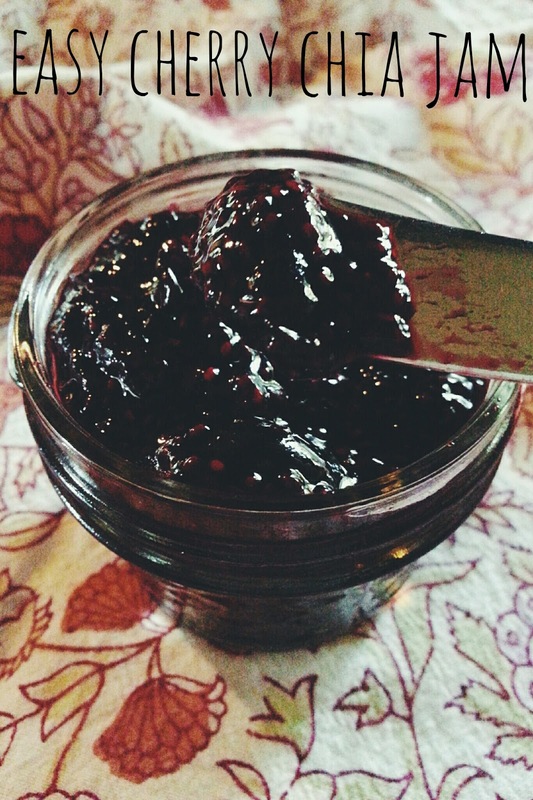 The desire to make jam last year came from the same reason so many of my other projects do. For my nephew. My mom was looking for ways to jazz up his little morning toast without adding tons of sugar. I'd heard of chia's amazing way of jelling, from many a chia-pudding recipe so I thought I'd experiment and give it a try making homemade jam that Oliver could enjoy. I would have liked to experiment with other kinds of fruits as I'm sure the process would work basically the same but I chose cherries to start because it's one of my husband's favorite flavors. 1. Add the cherries, honey and citrus juices to a pot and cook on medium heat until mixture begins to bubble. 2. Smash up cherries with a wooden spoon and periodically stir. 3. Cook 8-10 minutes more then turn heat low and add in the chia seeds. 4. Cook on medium to low heat until jam starts to thicken, stirring frequently to prevent burning. 5. When jam reaches desired consistency, remove from heat and allow to cool. Save in jam jars and keep in the refrigerator.